What if I don't have upper body strength? You are a perfect candidate for any of our beginner classes! We are very good at working with people where they are at and our classes are designed to help you build the strength you need in a fun, supportive, and exciting environment. Most beginners come to us without much upper body or core strength at all and we specialize in helping you build it through unique and effective exercises on aerial equipment beginning low to the ground, with clear instructions, spotters, and always working with mats. With our help, anyone can do this! I'm not very graceful. Will I make a fool of myself? Will I actually get off the ground and be on the equipment in my first lesson? Yes! We do incorporate ground exercises for strength training and to help you understand what to do in the air but the bulk of our class time is spent on the equipment. We will have you inverting and being suspended by the equipment on your very first lesson. We will also be teaching you correct form and safe technique very low to the ground with mats and spotters. We will teach you how to stay very safe while doing legit aerial work beginning on your very first day. Am I too old to take class? No! We work with all ages and abilities! We have students all the way into their 80's taking class with others in their 20's and everything in between. We recognize that everyone is different and we encourage conversations with coaches about any conditions or restrictions that may apply so that we can accommodate. Many of the exercises have variations or possible adaptations that allow us to customize to our students as needed so don't be shy! How old does my child need to be to take class? We start at age 5 for classes but we offer private lessons if your child is younger than 5 and at Age 13, children have the option of joining adult classes. It's totally okay. We start off working VERY low to the ground and as you slowly build strength and confidence and as both you and your teacher feel you are ready, you can begin to work higher up but it is important to remember that you can stay low to the ground for as long as you want to and we won't pressure you to work higher unless you really want to. Students frequently tell us that their training at Bumbershoot has helped them feel better about and overcome fears of all different kinds, this one included. Bumbershoot classes cost $30-$35 per class depending on class length and level. While this is definitely more than a gym membership or a Yoga class, we believe that our classes are well worth the price. After all, how much is your health, fitness, joy, and personal satisfaction worth to you? Can you put a price tag on the feeling you get when you accomplish something you never thought possible but always dreamed of? At Bumbershoot you will get a unique experience, high quality, specialized, hands on instruction and experience a supportive and empowering community like none other. Women should wear yoga pants or leggings that are mid calf or full length and a top that is long enough to tuck in or fitted enough that is will not move around when you go upside down. In more advanced classes you may be asked to bring in extra layers and/or wear a leotard under your clothes. Men should wear athletic pants that have stretch to the fabric and are not overly baggy and are mid calf length or longer. Running or biking pants work well. Shirts should be long enough to tuck in and not overly baggy. Supportive undergarments such as dance belts can be helpful but are not absolutely necessary. Kids should wear comfortable pants or leggings that are stretchy and mid calf length or longer with a shirt that is long enough to tuck in or a leotard. Everyone will work barefoot. Please DO NOT wear shorts or anything that has buttons, snaps, grommets, zippers, studs, or anything that can snag our equipment. ALL jewelry must be removed prior to class except very small stud or hoop earrings. What class(es) should I start with? We offer Intro classes on every apparatus! 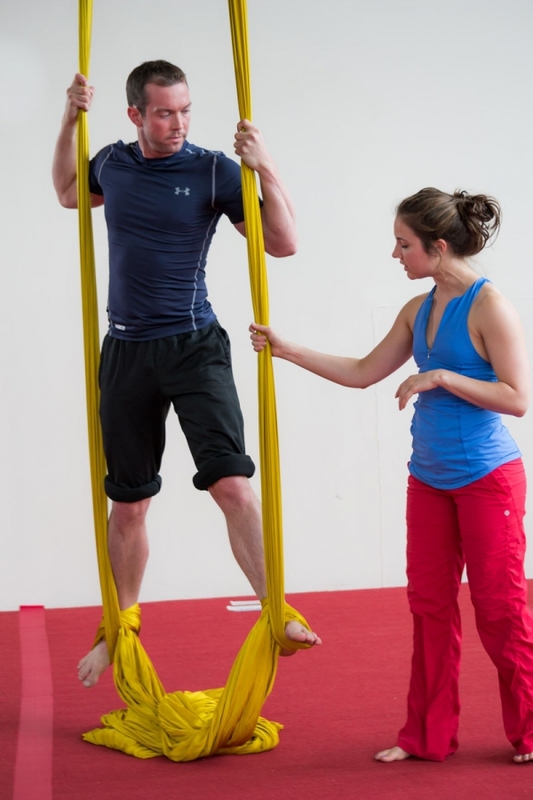 Aerial Fitness is another great option for beginners. There are no prerequisites for any of these classes and you can read the descriptions for each of these classes here. I want to get started but I'm not sure how -what are my options? The main two options are classes or private lessons. Many people do both. Classes are a bit cheaper and more social and super fun. Most of our classes meet once a week for 6 weeks at the same time each week. Some are 1 hour long but most are 90 minutes. Pricing varies but most 90 minute classes are $180 for 6 weeks and most 1 hour classes are $150 for 6 weeks. Drop ins are available in our Aerial Fitness, Conditioning for Aerialists, Straddle up Power, and Stretching classes for $35. Is there any way I can try it out before I register for a whole 6 week session? How can I connect with the Bumbershoot student community? What are the benefits of Aerial training at Bumbershoot? It's SUPER fun and unique! It's a great way to meet people and make friends! Aerial work will absolutely make you physically stronger, and more flexible. Increased mental clarity and ability to focus. Good conversation starter at parties! Helps you develop a healthy relationship with and respect for your body. Time spent around positive energy in a supportive environment. Did I mention it's really fun?